The liquid hydrogen peroxide sterilant is packaged in a unique disc that is crush and puncture resistant and air shippable, for rapid transport. 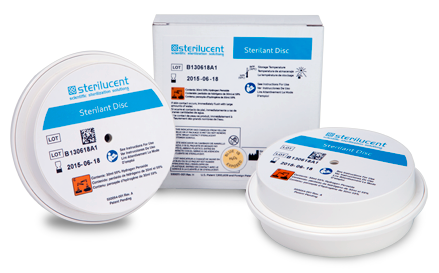 The sterilant disc has a two-year shelf life, which is ideal for organizations that require longer-term staging for preparedness. The Disc is designed for easy handling and can be loaded in any horizontal orientation. As a safety precaution, the bar code on the labels includes expiration dates and lot number information that is read by the sterilizer. The system is programmed to prevent the use of expired product.